iOS 7.0.3 has been released for all supported devices. 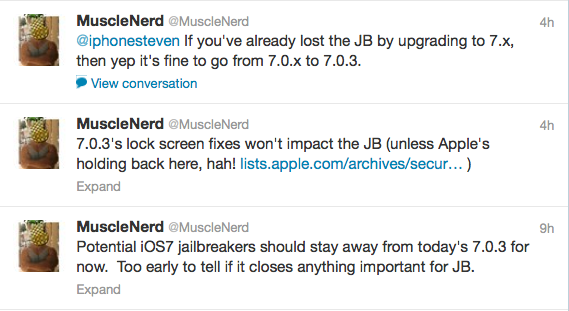 Go ahead and update as it is safe for prospective jailbreaks as confirmed by MuscleNerd. At first he asked users to wait before updating but we can see from his tweets that it is indeed safe to update. This entry was posted in iPad, iPhone, iPod and tagged 7.0.3, ios, jailbreak, musclenerd, safe, update. Bookmark the permalink.